I am in a very fortunate position that I'm allowed to have my own ‘eBay room' in our house. In my usual thrifty ways we've secured an amazing rented house with 3 bedrooms at a reduced rate. I still look at Rightmove and see two bedroom flats for significantly more than we pay for our lovely 3 bedroom house with a garden and parking – we are extremely lucky! Tony has his own room so that he can keep all his Nerd Stuff away from my Princess Stuff, but we also have a spare eBay room. When we first moved into the our house (9 months ago) it was a complete dumping ground and at times I haven't even been able to get in the door. 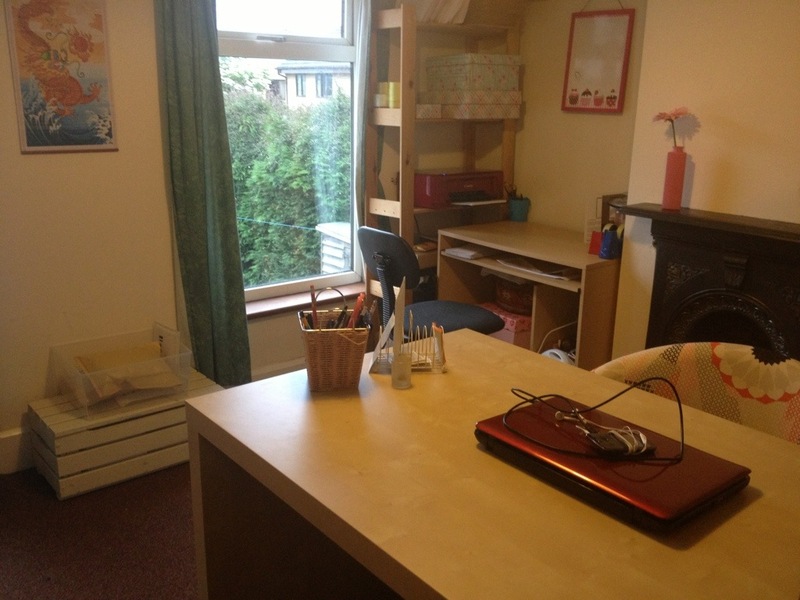 Here is a smaller photo(taken from my Twitter) of the room over winter. VERY crowded indeed. But this all changed a few months ago when I discovered Pinterest – I suddenly wanted a functional room as well as not seeing all my Amazing Crap For Sale on display. Of course I knew that I had to head to Ikea for the Expedit shelves and desk – nothing else would do. My original plan was to go for the white units, but despite costing more than the birch effect I ended up with, the white ones looked extremely cheap and as though they would be marked up or chipped within a week. I have a desk from Ikea in white and found that it did in fact chip whilst building it, so I talked myself into the cheaper birch option, meaning I had more money to buy Cath Kidston fabric boxes! As you step into the room you are now greeted with a large Expedit desk – the desk is so big that it means both Tony and I can work opposite each other with our laptops and not get in each others' way. This was an added bonus to me as I hadn't considered that we'd be working alongside each other in the eBay room, but he has been selling some of his Nerd Stuff extremely well lately! I cannot put into words how pleased I am with the Expedit shelves. The money I saved buying the birch effect meant that I could buy the Cath Kidston designed fabric storage boxes – I went for 8 in the end. You can see 6 here with two under the desk. The boxes are massive and I'm able to store eBay items in them into categories such as clothes, shoes, etc. The chair is from Ikea, via eBay and is very comfortable! The floral box in the top left shelf was a freebie at a boot sale – I'd seen a trader selling loads of ex-supermarket items and I proceeded to purchase a few items from him. He was using this box to store kitchen utensils in, and when I asked if he could tell me where I could buy one, he told me to go back at the end of the day and I could have it for free. Imagine my surprise when I rocked up after leaving Tony to pack away our stall, only to find that he had emptied it and it was waiting for me! I use this box to store everything I need to photograph or list in – once I've photographed and listed an item it then goes into its designated fabric box. The two shelves above the desk on the right are Tony's selling items – these were brim full last weekend when he had a lot listed on eBay, but all the Nerd Things are now with their new owners. On top of the shelves I have some Ikea drawers – the RRP is £17 but I picked them up at a boot sale for £1.50 and painted them white. I've not found a use for them yet so I have a feeling they may end up being sold. The round boxes in front are from Store 21, years and years ago. Then to the right I've got some magazine holders. The first 3 were just plain ones bought from Ikea and then covered with wallpaper ends I nabbed at a boot sale for 50p. The first three are used for proof of postage on a rotation system so that every 3 months the old ones are thrown out. I've then got some small pieces of furniture that we've been ‘shabby chic-ing' up in order to sell. This fireplace sits behind my chair. The vase and flower are from Ikea, the heart is from Sainbury's via a boot sale, the quote canvas is from The Works and the chalk board also from Sainsbury's via a boot sale. A main requirement of my eBay room is that I wanted somewhere to parcel my items without having to take them downstairs to the dining room table, no doubt leaving jiffy bags and cellotape in my wake and cluttering up our living areas. We also like to reuse jiffy bags, so I needed some functional ways to store these. Welcome to the parceling station. 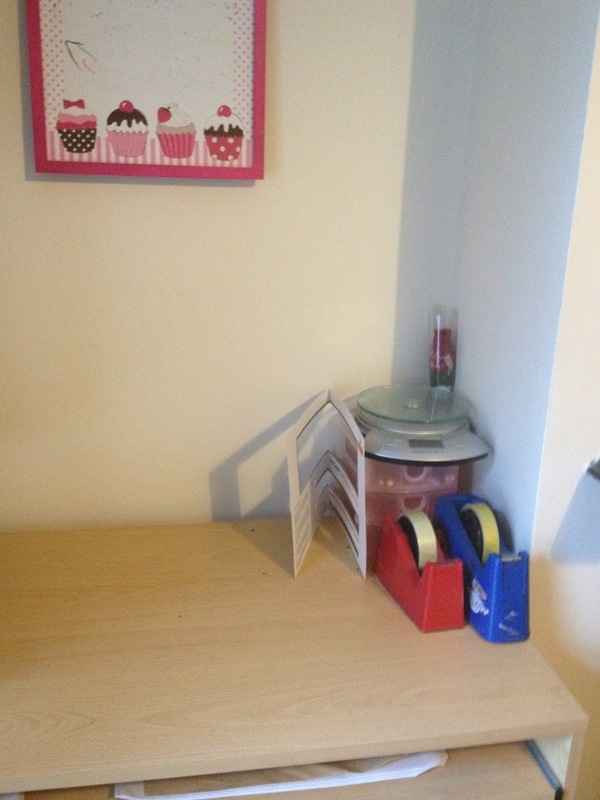 This is a small desk (bought from Argos when I first started uni!) perfectly fitted into an alcove with a cheap wooden bookcase (years old from a charity shop). Top to bottom of the bookcase we have two different sized new jiffy bags, boxes (just covered with nice wrapping paper) full of used jiffy bags and bubble wrap, cellotape and parceling tape, wireless printer (Argos, £39.99) and then out of view the shelves are crammed with Amazon boxes and any other boxes we think might be useful. We print out 99.9% of our postage at home online via Paypal or eBay, just onto plain paper (you can get two addresses per sheet) so that postage is deducted straight from our Paypal accounts. On the desk itself I've got two cellotape machines in case Tony and I are parcelling at the same time, kitchen scales, a Royal Mail size template, set of plastic drawers with useful labels (airmail, customs, etc) and a tin pen holder. To the side of the desk I've got a crate I picked up at a boot sale for £4. I had no idea what to do with the crate, other than I needed it in my life. At the moment it is full of jiffy bags I've bulk ordered on eBay. On top of it sits a plastic tub for outgoing parcels – Tony kindly takes these to the Post Office for me as and when needed. We're looking to upgrade this plastic box but we're not quite sure what we want to use – any ideas are appreciated! Please excuse the white bits of paper on the floor – I had a fight with a hole punch and the hole punch won. 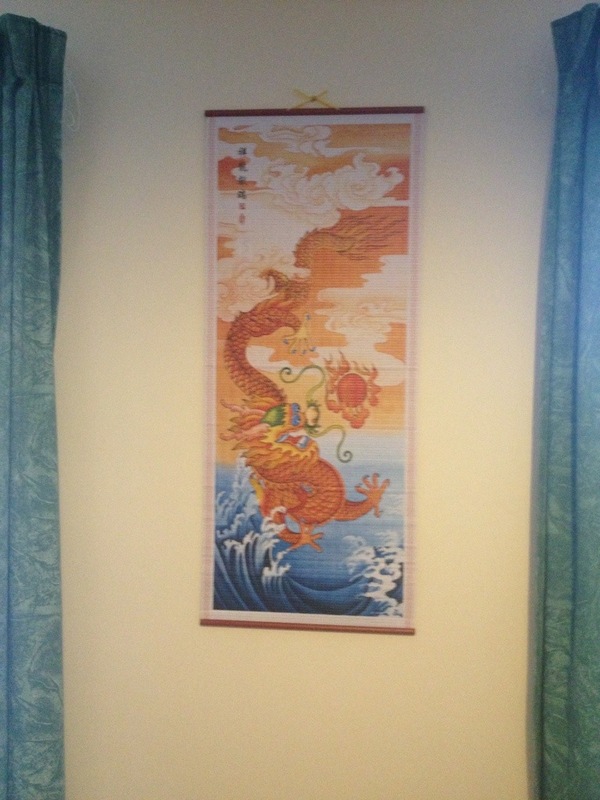 Above the crate and parcel box is this Chinese scroll that Tony bought for me – it is meant to promote success and wealth, so fingers crossed. For some reasons this is one of my favourite areas – the letter area. The filing cabinet was bought from Facebook for £5 and the top drawer is crammed full of important papers. The second drawer has office supplies like paper, ink, blank CDs and other bits and bobs. Long term I'm looking to repaint or cover this, but I'd need to do it outside and the cabinet is so heavy that I don't want to even think about it yet. 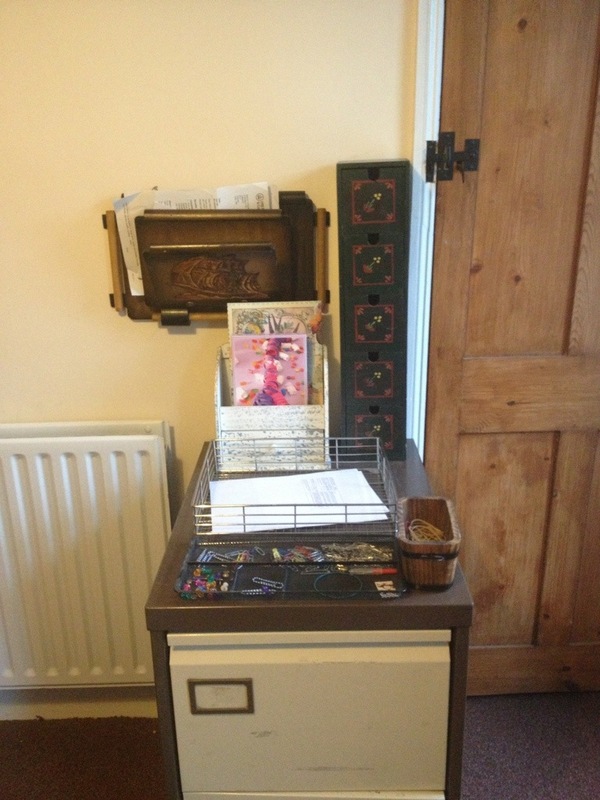 The letter holder hanging from the wall was at a boot sale for £1 – I had no idea what I could do with it, other than that I needed it (noticing a trend?) especially when I discovered it was only £1. The green drawers were another boot sale find for £3, but these haven't been used at all so they might end up being resold. The white box at the back came filled with toiletries in a gift set years ago – perfect for writing paper and cards. I've then got a wire tray for all shredding (the shredder lives under my desk). I try to keep the desk as clutter free as possible, but also with my ‘must dos' in clear site. I've got a pink basket used as a pen pot (50p at a boot sale) and a toast holder (£1.99 from B&M Bargains) as a letter holder. 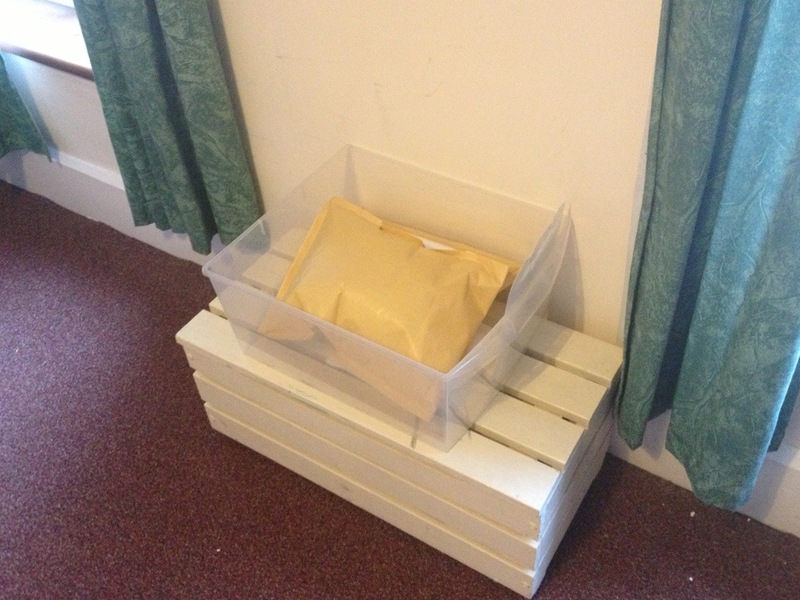 I make a clear effort to go through the letter holder every time I'm upstairs in the eBay room to see what needs to be done – just this week alone I've managed to send out so many forms that I've been meaning to get around to. The shot glass is for foreign currency we keep seeming to find everywhere – possibly from all the boot sales we seem to do. The desk also serves as a great place to take photos of smaller items, and clothes are either hung on a coat hanger from the curtain rails or they get taken into the bedroom next door to photograph laid out on nice bedding. Overall I absolutely love my eBay room. It is a great den to retreat to and have a productive area for not only eBaying, but also for blogging and other ventures. 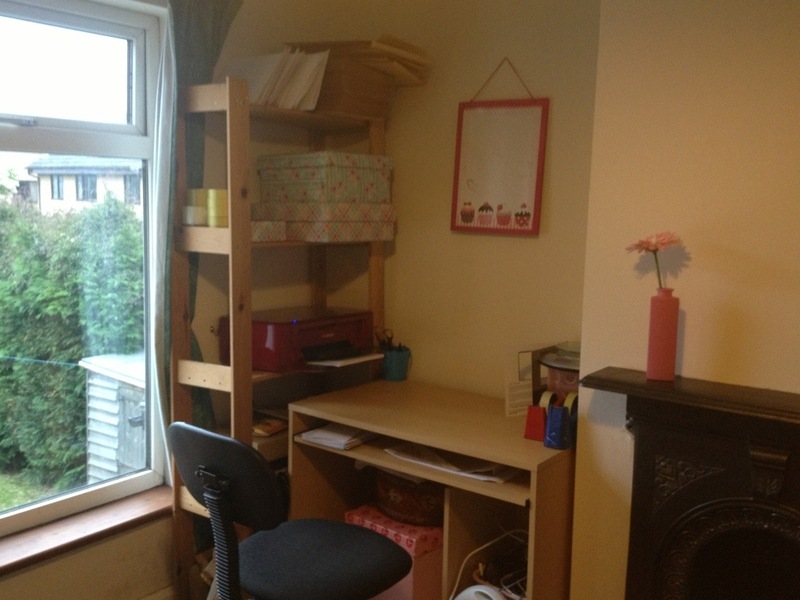 It is great to have a clear area to work on without having to move things and to have all my selling items in designated spots and not to be spending hours searching for them. Having my ‘to list' items in one box also serves as a visual reminder to get on with getting them photographed and listed. Over time the idea is that my selling items will become less and the room will be used for as an office, but an eBay room has a much cooler ring to it! 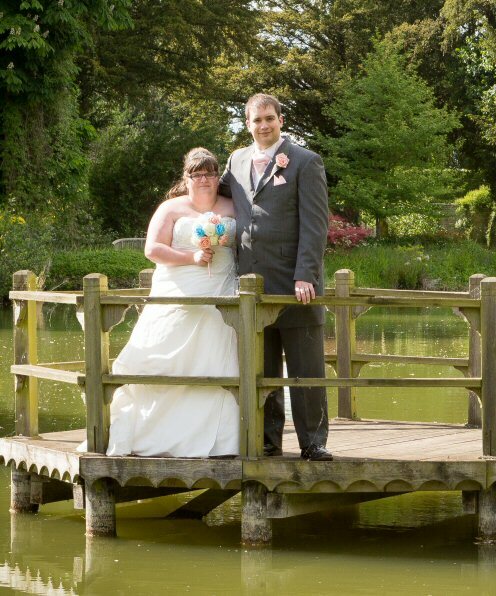 Wow, I am hugely jealous! Love it! I seem to have an ebay house, with stuff for ebaying, facebook selling etc scattered hither and you. I suppose having 2 small boys doesn’t help! Love this! My outgoing parcels go into a large tote which is hung on a hook near the door – maybe something similar would work for you? Then, all I need to do is pick it up as I go out, rather than searching for bags & fitting it all in. P.S. Do you have a pinterest? I’d love to follow! Room looks gorgeous, I need one in my life! I think the reason I don’t take my ebaying seriously is because everything is everywhere! I’ll be getting onto this, soon. Another one who wants to follow you on Pinterest, and I also need tips on how you haggled your house down. I want to rent mine out next year, and I’ve already spied somewhere that I want to rent for myself so all hints and tips are welcome! Thank you! 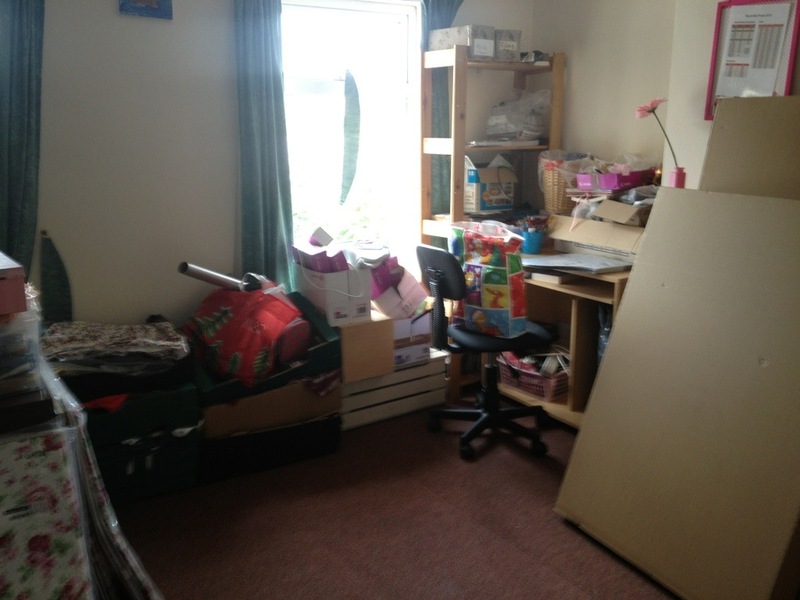 We’ve just changed rooms and this is now our spare room, so I can’t wait to share the new eBay room. Loving the ebay room, I have recently started using ebay and love it. 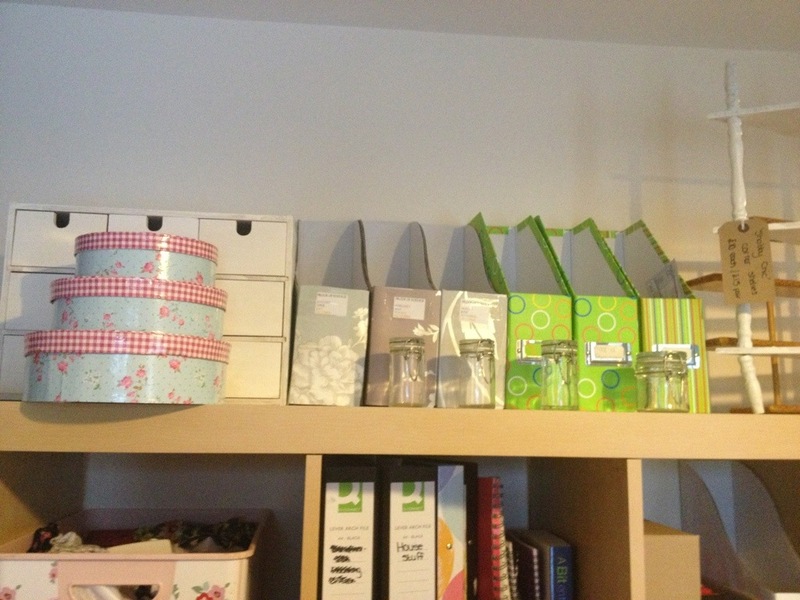 I get crazily obsessed with storage…I just have a lot of junk for eBay so I like to be able to store it somewhere.